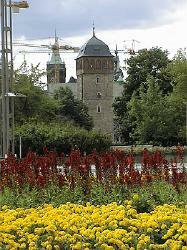 GREETINGS FROM CHEMNITZ, Manchester's twin city in Germany. 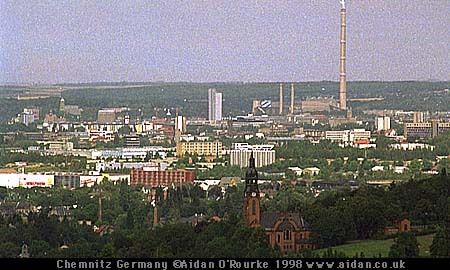 Chemnitz (pronounced Chem as in chemical and nitz as in Leibnitz) is a major industrial city in Saxony, in the eastern part of Germany. Currently the city is undergoing major reconstruction following the fall of the GDR and German reunification nearly ten years ago. As in Manchester, much of Chemnitz city centre is a huge building site, as in this picture of the Red Tower which I took using the digital camera today.- Next to the New Town Hall, a new shopping centre is under construction - some of the old GDR blocks will be torn down, but many others are being renovated. It will take several years before the new Chemnitz city centre is finished. Things are happening here, but it will be some time yet before Chemnitz has achieved full economic regeneration. Salaries in the east are still lower than in the west, and unemployment in Chemnitz is well above 10 per cent. In 1988, nearly 320,000 people lived here - now the population is 270,000. Most of them went to the west to seek employment. SO WHAT IS THERE TO SEE IN CHEMNITZ? - Tourist attractions include the Municipal Art Museum,and the Museum of Natural Sciences, both housed in the same building next to the Opera House. 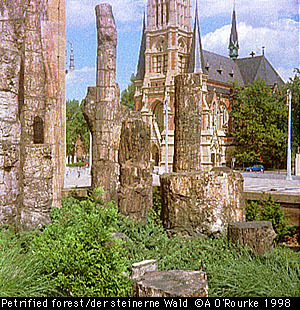 In front of the Museum of Natural Sciences, you'll find a unique exhibit: a group of trees which were turned to stone millions of years ago. This is the Petrified Forest, one of only four surviving examples in the whole world. Close by, you'll find attractive streets with beautiful facades, some unaltered for 40 years and now being renovated. 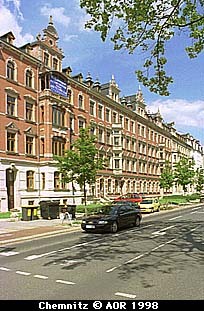 The Kassberg district has many such buildings, and is becoming quite a fashionable place to live. A medium-sized two bedroom apartment (60 sq metres) would cost 720 DM per month or 260 pounds sterling per month . 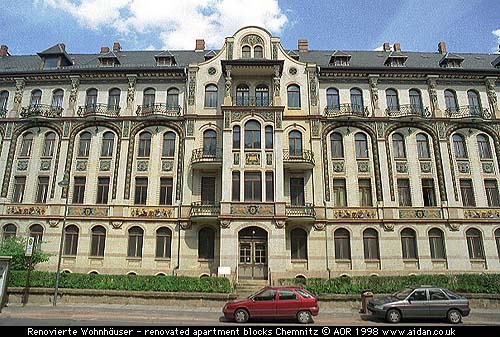 Elsewhere in Chemnitz, rents are lower. Within 25 km of here there are more attractions. The magnificent hill-top Augustusburg, with its Renaissance castle - dating from 1568. A cable railway takes you part of the way up. 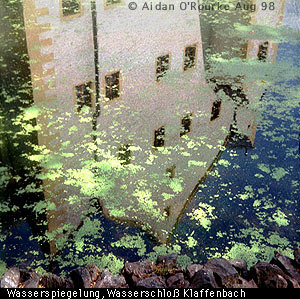 The beautiful Wasserschloss Klaffenbach is now a hotel and restaurant, with a small transport museum. 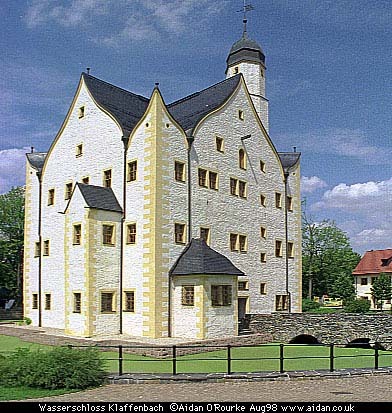 Rabenstein Castle is another famous landmark, and you can also visit the nearby Rabenstein Rock Cathedrals" part of a former mine, and a visitor attraction since 1936. As in Manchester, there are too many things to see on a short visit so I'll be returning here again soon. This time I've come by car, but maybe next time I'll take the train. It's 3 hours from Berlin, and six from Munich = unfortunately no Inter-City trains run to Chemnitz, but it's well connected to the rest of Germany by Autobahn. 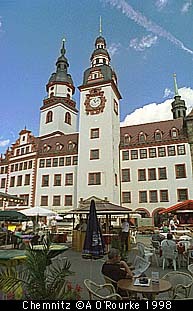 Saxony's other two main cities - Leipzig and Dresden are a short distance away. In the 19th century, Chemnitz was once known as the 'Manchester of Germany' on account of the huge number of factory chimneys pouring out large amounts of smoke which used to hang over the city. Chemnitz, like Manchester, was at that time a centre of textiles and engineering, and these industries continued to be important right up till the end of the GDR 10 years ago. If you look in old picture books, you'll see that pre WW2 Chemnitz had preserved its 19th century buildings almost intact. Sadly, this historic city centre was virtually destroyed by WW2 bombing raids, and Communism finished off most of the rest. 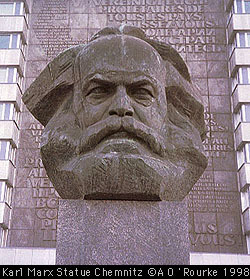 In 1953 Chemnitz was renamed Karl-Marx-Stadt, and the city was rebuilt according to Communist principles , with prefabricated concrete housing blocks, wide streets adorned with heroic, Soviet-style statues, including the head of Karl Marx. 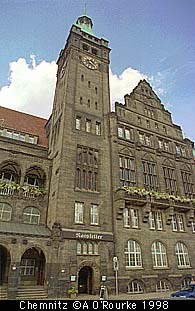 In 1989, the GDR collapsed, and the following year, Karl-Marx-Stadt became Chemnitz and suddently found itself in the Federal Republic. Soon, reconstruction began and it continues today. THE MAIN NEWS ITEM in the papers this weekend is the continuing debate about shop opening times. In Germany shops have to stay closed on Sunday, unless they are in or near a railway station or petrol station and are selling 'travellers provisions'. Now many shops all over Germany want to open on Sunday, as in the UK, but politicians, members of the public, and the churches, are against the idea. Saxony is the only federal state which allows Sunday opening - as long as the shops are situated in a tourist centre - so for the past three weeks now, the department store Kaufhof has been open on Sunday. Other shops outside the centre must remain closed. It doesn't look as if Sunday opening is going to be allowed in Germany - there's too much opposition to it among politicians and religious people. But in compensation, shopping hours on weekdays have been extended to 8pm all over Germany. ECLIPSE FEVER is taking over Germany, with only a few more days to go before the Sonnenfinsternis or darkening of the sun. 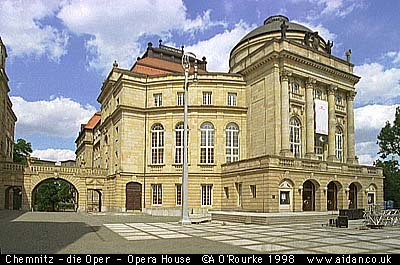 I'll be heading south to see it - it passes over Stuttgart through Munich and on into Austria and Romania. THE WEATHER in Chemnitz is hot - 27 degrees celsius, 86 degrees fahrenheit. It clouded over a little today, but the sunshine's come back. I'm off out for a few glasses of excellent German beer in some of Chemnitz's drinking houses with Marko Maethe, who publishes the extensive www.region-chemnitz.com. It has an excellent collection of over 100 photographs, plus lots of info on Chemnitz. The Chemnitz municipal website is www.chemnitz.de and the university is www.tu-chemnitz.de. 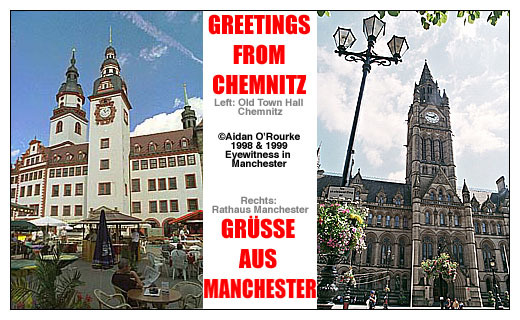 AUF WIEDERSEHEN from Eyewitness in Manchester and hope that some time, you'll visit Chemnitz Manchester's twin city in Germany.